We joke about the evil genius, Charlie Coles. I didn't realize that he actually didn't make the team's trip to Buffalo due to illness. He was hospitalized with a virus that "weakened" him. He is expected to be back tonight. At the age of 70, however, he has hinted that me may retire at the end of the season, although he isn't sure. In which case, this would be his last game in Bowling Green. I poke fun at him, but make no mistake. He is a true original and I love to watch him coach. He's just a nut. (When he took over the MAC career win total and went to hug Bob Nichols, that was about as funny as it gets. Nichols looked about as uncomfortable as a man could look). The MAC will miss Coles whenever he decides to go. In today's clone-coach world, we're not likely to see one like him again. As we await the arrival of the evil genius, we can catch up on a little football news. BG had a late verbal and it was another JUCO WR. It is our second. BG had another one commit and then go to Nevada, so I guess we had a target for 2 JUCO WRs. Jared Cohen committed to BG. He played last year at Golden West Community College, which (surprise) is located in California. He caught 47 passes in 11 games last year, 12 of them for TDs. He averaged 13.3 yards per catch, which is pretty good. A RB on the same team is headed to South Florida. Anyway, BG is clearly concerned about depth at WR. Don't forget that a guy can still redshirt even as a JUCO transfer, so you might see that somewhere in here to space guys out. It has not happened for ten years....BG has not vanquished the evil genius twice in the same season since, 2002. In fact, BG swept both the 01 and the 02 series after even Coles overdrew his evil account when they ripped BG's chest from its heart in the 2000 MAC tourney. Since then, once the universe stabilized, BG has never been able to get the evil genius twice in the same year. And that opportunity will exist tomorrow at the Stroh. This has been a tough year for evil. The Red Hawks are 9-18 and 5-9 in the MAC. There have been suspension, dismissals, injuries. Could karma be catching up to Mr. Coles, the universe's malevolent revenge? I'm not inclined to think that way. The first time through the East, Miami on only one game (Buffalo at Millett). They split on the cross-overs, including losing @NIU. Back in the East, they did beat Kent in Oxford, but the Falcons also beat Kent on our home floor too. They lost @Buffalo by 10 in their most recent games. 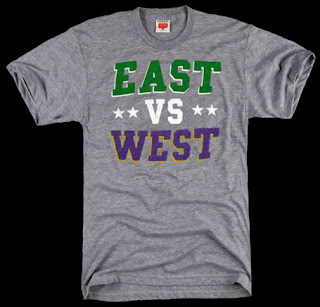 So, there is a perception they are playing better, but everybody in the East used the West as a buffet table. I'm not sure they are playing that much better. Like a lot of struggling teams, they are sucking wind on the road. Their only MAC road win was @BSU. The first time the two teams played, it was a close game for 32 minutes and then BG shot out to a 10 point lead that they nursed home. The Redhawks battled back but never got within 5 with the ball just inside a minute, but BG finally got a stop and rode home to an 8 point win. BG had 10 steals in the game and shot 50% from the field, making only 2 3s. Thanks to the turnovers and poor 3 point shooting, BG held Miami to .9 points per possession, which is where the Falcons need to be to win. Jordan Crawford seems to play well against Miami, and he went crazy with 25 points on 10 of 13 shooting. Thomas double-double at 11/11 and added 8 flipping steals. Brown and Calhoun also scored in double figures. Cam Black blocked 3 shots. Miami was led by their best player and one of the MAC's best players, Julian Mavunga, who had 17/7 assists. They had no other players in double figures. This Miami team is a little different than normal. Typically, the evil genius puts a defensively-minded, slow-paced team on floor. However, in MAC games, they are 11th in defensive efficiency. That is simply not typical. They are 8th in effective FG% defense, and 10th in forcing turnovers. They are in the middle of the pack on the offensive boards and are 9th in allowing free throws. It is a little interesting, because you wouldn't expect those numbers to add up to 11th in defensive efficiency, but somehow they do. BG has been shooting well at the Stroh and will need it to continue. Offensively, Miami is not too bad. They are among the top 2 3-point shooting teams in the MAC and no team in D1 gets a higher percentage of its points from the 3-ball. Coach Orr was asked if BG would go man in response to that, (Miami shot only 30% the first time the teams played) and Coach kept his options open while saying that he thinks zone is our best defense right now. Miami is 3rd in effective field goal %, but only 7th in offensive efficiency. They are last in the MAC in getting to the line and last in offensive rebounding (a classic Coles trait). They care good care of the ball (4th in turnover percentage) so clearly, the rebounding and free throws are holding them back. At 60 possessions per game, they are the second slowest team in the MAC, so that's not changed. Mavunga is the guy everything runs through. In MAC play, he is scoring 15 points, getting 8 rebounds and 4 assists. Their other double-figure scorer is FR Brian Sullivan who is scoring 12 points and leading the MAC with 47% of 3s made (and 2nd in attempts). Jon Harris and Quinten Rollins are also averaging 9 points. Harris and Josh Sewell are both shooting 46% from 3. So, to me, the keys are for BG to defend the perimeter effectively, manage Mavunga and then exploit Miami's weak defense on the other end. On senior day, you'd love to see Scott Thomas and Dee Brown light the place up. This is a game BG needs to win. Their hopes for a bye still exist, but wins are needed. The Falcons played well against Kent (though far from a perfect game). We're running out of runway, but you get hot now and it changes a lot. If its one step forward and one step back...then that's what you are going to finish with. (Note: see comments below and thanks to Jason from BGSU for jumping in. Contrary to popular belief (as least his and mine) division record is not a tie breaker unless it is for the division title, which is meaningless anyway. It is head-head and then ranking the teams and comparing records from top to bottom. So, anything you see below is probably off when it gets to division record). We regret the error. So, what could happen from this. Well, to start with, there is a chance of a five-way tie at 10-6. Under that scenario, BG finishes 5th, based on my calculations. BG can still finish 3rd. In a 4-way tie with BG, Kent, BG and OU, with that loss to EMU now out of the tie-breaking equation, Buffalo would be 2nd (4-2 among those four teams) and BG and Kent would tie for 3rd at 3-3. BG and Kent split, but BG would have a better record against the East and win the tie-breaker against Kent, so BG is 3rd, Kent 4th and OU fifth. As noted, it is possible for BG to win out and not get a bye. However, assuming we're talking 10 wins, BG wins the tie-breakers with Buffalo and Kent...both Buffalo and Kent swept the West and BG did not, and that means (somewhat perversely) that they there had to do worse than BG in the East in order to end up in a tie. BG lost once against the West and OU twice, so if BG and OU tie than the Bobcats win that one. There all kinds of multi-way ties. Buffalo lost twice to OU so they want to stay out of a tie, and BG's loss to EMU means we want to keep them out of the tie-breaker. Those scenarios all require two BG wins to activate. What about one? The answer is that at 9 wins, BG clinches 5th only if EMU loses both of their games, which is certainly possible. I know we should beat any of those bottom teams, but I would feel a lot better playing NIU than CMU, who has some talent that could go crazy for an upset. BG could get a bye with nine wins...in a 3-way tie with EMU and Kent, however, Kent would be 2-1, EMU 1-1 and BG 1-2, so in that situation we finish 6th. So, with one win, BG needs EMU to lose twice and Kent to lose twice. Kent plays only at home, but against OU and Akron. BG cannot finish lower than 6th. Worst case, BG plays one of NIU, CMU or Ball at the Stroh. In fact, even in a 4-way tie with WMU, UT, and EMU, BG finishes 5th. Clearly, things will be more clear tomorrow. Meanwhile, if you are a Falcon fan...you want BG to win, and EMU to lose tomorrow. If you want to aim big, you want Kent to beat OU and Akron to beat Buffalo. Kirk Cowan noted in the post-game that he saw the Kent players bickering as they left the floor at halftime. And that's what I'm talking about. You go through a whole season...ups and downs, unfulfilled potential, missed opportunities, and then a night like THAT happens, BG puts it all together, beats one of the MAC"s model programs, stems the tide in a game that you just had bad feelings about...that's what keeps the fans coming back. The first thing I think about from the game is that Scott Thomas was a warrior tonight. We're only going to see him play one or two more times on our home court, and I know that he has been so steady that it has been possible to forget about him completely. He doesn't have senioritis...he's finishing fast and strong. Against Kent last night he had 21 points, 6 of 10 from beyond the arc, a team high 7 rebounds, 3 assists, 2 steals and a blocked shot. But you're not a warrior just for numbers...Thomas was a presence on both ends of the floor. At least a couple of his rebounds were ripped from the hands of Kent players. It was probably the best performance by a Falcon this season. Let us appreciate. BG played solid, winning basketball for almost the entire game. BG went up 5-0 and then Kent went on a 12-2 run and you could start to feel them asserting themselves, but BG turned it back. BG took a 30-27 lead with 6:05 left and never trailed again. For most of the first 10 minutes of the second half, the lead was hovering in the 5-8 range, and then with 9:00 BG got two fastbreak DUNKS from (one each, Calhoun and Oglesby) to put the lead at 10 for the first time. I've been writing here there comes a time in the game when you have to make plays...not all plays are equal...sometimes one play rings huge. Tonight, BG made those plays. With about 7 left, Kent had it down to 6 again, and Oglesby made an old school 3 and then a MONSTER dunk on an offensive rebounds (consecutive possessions) to put BG up 11. It was never within single digits again and the Falcons ended up with a stunning 16 point victory. Our preview said the key was defense. 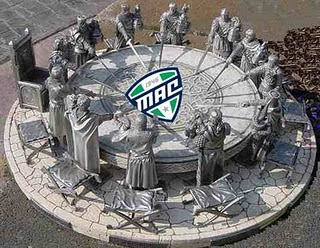 Kent is the best offensive team in the MAC. Last night at the Stroh, Kent had .84 points per possession, their second worst performance of the season and the worst in MAC play. (Only Cleveland State held them to lower efficiency.) It was defense built on Kent shooting 46% (which is pretty good) but only 4 of 14 from beyond the arc, and they hit a couple early meaning they were held very cold for much of the game. BG forced a team that does not turn the ball over often to turn it over on 30% of their possessions, and that combined with the shooting issues made it difficult for Kent to score. They also did not get to the line and only got 27% of their available offensive rebounds. Meanwhile BG had 1.07 points per possession. BG didn't dominate Kent in any one facet, but beat them in nearly all of them. Except for FTs, all the key factors went BG's way. BG shot 54% with an eFG% of 62%, which is pretty good. The Falcons had a lot of turnovers, too, so that didn't help, but they had fewer than Kent, and that was a key factor. Calhoun, 17 points on 8 of 11 shooting and 4 rebounds in 25 minutes. Oglesby, 15 points, 5 rebounds and 2 blocks in 20 minutes. Oh and 7-8 shooting. Crawford, 8 points and 6 assists (4 TOs). Sealey, 6 points, 3 rebounds and 3 steals in 12 minutes. Jehvon Clarke, 3 rebounds and 3 assists in 7 minutes. Even Cam Black, who did not even shoot once, had 3 blocks and 3 steals in 20 minutes and appears to be an increasing force on the defensive end. In particular, BG did a great job with Kent's very strong guard corps. Yes, Guyton had a big night, but Porrni and Holt did not do serious damage to the Falcons. And so it does. BG wins a huge game at the Stroh. It was very a great night to be a Falcon. Nights like this, especially late in the season, are like oxygen. Because when you see our guys play like this, you think to yourself, "why not us, why not now" (to steal a quote from a former Falcon coach). If the Falcon are this solid and can string those kind of performances together, they can compete with anyone in our league. Yes, I know. BG has yet to do that all year. But this! They haven't done this since the Temple game. It has happened before....a team finds its confidence late and makes a run. This Falcon team has teased us this year, and I think we have always hoped we were better than we were showing. Here's the thing. you only have to be good now for six, maybe 5 games. It is a good time of year. And that, of course, is what keeps us coming back. When, after weeks of up and down play, win at home, lose on the road, when after all that your team comes onto the floor and out of nowhere plays their best game of the season (or maybe second best) and pulls of a huge, emphatic win over one of the conference's top teams...yeah, that's the stuff. I believe with the Falcon win and the WMU loss, BG has clinched 6th. Even if you ended up with a four way tie at 8-6, BG was 2-1 in that group, EMU would be 3-2, and WMU and UT 2-3, so BG would finish 5th under that scenario. BG wins a head-head tiebreaker against WMU or Toledo and the best they can do is tie BG. I'm always cautious about these scenarios, but even a 3-way tie with EMU, BG and WMU (for example) would leave EMU 2-1, BGSU 1-1 and WMU 1-2, meaning BG is 6th. So, at worst, BG plays at home against probably NIU or CMU. On the upside, EMU has no more home games left, so BG has a shot at finishing 5th. And, in fact, BG is still in the running for a bye. BG could win out and Kent could split, and BG wins a head to head tie breaker with Kent because of the season split and BG would have a better record against the East. You get into all kinds of things with multiple teams in a tie breaker and the cart is a little ahead of the horse, since BG still has two tough games ahead. Of course, with the big win, what you hear in your head is "what if"...as in...."what if this team can replicate that performance coming home?" As the season begins to wind to a close, BG is now in a tight struggle with relatively small stakes. Right now, realistically, they are looking at somewhere between finishing 5th and 7th, all of which require a first round game at the Stroh against one of the lower ranked teams. Kent, on the other hand, is in a tight struggle with huge stakes. They are in a 3-way tie for a bye into the semi-finals of the tournament and cannot afford to take on any more water after they lost their last conference game @Miami. Kent is one of the MAC's perennial powers. A 20-win machine, they simply don't (or haven't) had off years. Stars graduate, coaches leave, and Kent keeps producing winning teams. This year, of course, is no exception. They are 19-8 on the year and 9-4 in the MAC. They beat West Virginia to start the season and they beat a decent UAB team along the way. Their RPI is 106. The reason they are just tied for the semi final bye is that they have not been as good winning on the road as Akron has. In fact, Kent is only 7-5 on the road for the year. After WVU, the best road win was against EMU. The Flashes have yet to win a MAC East game on the road. Kent beat Morehead State by 20. These two teams played in January in Kent in a game that was an unusual shoot out. The Flashes won 92-87 in what was the Falcon's worst defensive game of the year. In case you forget, BG was down 18 at the half and then came out and had 60 freaking points in the second half. BG had 9 3s in the second half of that game. The game was not as close as the score might indicate--Kent led by 10 inside of a minute and BG nailed a couple of 3s in the last :15 to narrow but not close the gap. In the end, Kent had only 8 turnovers and BG 16, and Kent shot 29 free throws. BG did have an incredible game on the offensive boards, grabbing 56% of the available missed shots. Scott Thomas had 23 points and Oglesby had a double double for BG in that game. For the Flashes, Greene had 23, Porrini 19 and Holt 17. Guyton added 10 assists. Kent certainly did light BG up on offense, and that's not surprising. They lead the MAC in offensive efficiency, effective field goal %, 3-point %, and turnover %. They are 5th in FT Rate and 8th in offensive rebounding %. When you are highly efficient on offense and you don't turn the ball over and then you are good at making your shots--that's a potent combination and one you don't see too often. BG is simply going to have to play better defense than they did in the first game and than they played against the Zips in our last game. Now, given Kent's record, it doesn't take too much deduction to figure out that they are not the world's best defensive team. They are, in fact, 8th in the MAC in defensive efficiency. They are 6th in turnover % and 7th in effective FG% defense against. They are not good on the defensive boards (11th) but don't give up very many free throws (2nd in MAC). It would be great if BG brought its home shooting shoes and lit things up like they did against Morehead. Even so, I think defense is the key. We can't afford to play "tag" with these guys. That's their game. And, of course, when the game hits crunch time, the Falcons need to be the team making the key play--the key steal converted to a basket--that can put the game away. This is the most experienced team in the MAC, with 8 Jrs and Srs. Reigning MAC POY Justin Greene leads the Flashes with 15.7 PPG and 6 Rebounds. Randal Holt is scoring 14 points a game and Chris Evans is scoring 10.7. Michael Porrini is averaging 9 points per game to go with 5 rebounds and 5 assists. Carlton Guyton averages 4 assists per game. This is a very good team that has not played well on the road and lost their last MAC game to Miami. They have a lot to play for. As I noted yesterday, BG has only beat a team that is currently ahead of them in the standings once this year, meaning that the Falcons have (pretty much) beaten who they should and lost to who they should. The Kent game is the opportunity to change that trend and pick up a very key win. Not to be depressing, but all 3 games BG has are tough, and while only one is on the road, 1-2 or even 0-3 are not out of the realm of possibility. You have to win a game like this to keep it from happening. 1) Bracket buster results: what does the performance this Saturday say about your team / the MAC as a whole. From BG's perspective, we confirmed that when a team has an effective field goal % in the 70's, they aren't going to lose very many games. BG simply had a hot hand and cruised to an easy win over Morehead. Another thing. 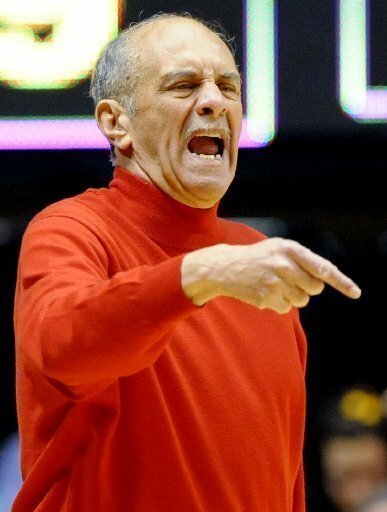 I have no idea what he makes, but Morehead's coach would make a great coach in the MAC. He has that team playing .500 minus Faried, their second leading scorer from last year and their best returning player who is injured. As for the conference, I mean, we are who we thought we were. The MAC had a better pre-conference season but is still ranked #20 in the conference rankings. The rough bracket buster day was just a symptom of that overall malaise. 2) UB has now dropped two straight after winning eight in a row, is this going to be like 2008-2009 where the Bulls fade down the stretch? Got me. I'm not the person to ask, because I have generally thought that Reggie Witherspoon is the worst coach in the MAC for years. That's partly non-rational--I just don't like the guy--but while he is good at bringing players to Buffalo, his primarily strength during the games is theatrics. 3) With cross division play wrapped up which team in the West looks most able to do damage in the MAC tournament. I know the easy answer is WMU, but I'm going to take EMU. Solid defense doesn't have an off night, and I think you'd have to be afraid of facing them just because they bring you to their level. 4) Who in the East, aside from Miami, is in the most Danger of not notching up a first round bye? Bowling Green, who essentially has no shot. It is pretty clear who the top 4 teams are for the regular season. The last two road games (and the last two MAC games) have hinged on one possession. In Athens, BG battled back to take the lead with about 5 minutes left and had the ball, with a chance to extend the lead and instead turned the ball over and saw OU go on a 20-4 run. Last night at the JAR, BG had battled back to create a one-possession game and then got a stop and had the ball. Cvetinovic got a block on Clarke and Akron converted at the other end with a hoop to go up 5 with 1:28 left. BG followed up with a turnover and Akron hit another layup to be up 7 with just under a minute left and it was all over. That's what it has boiled down to. You either need to make those plays, or be so far ahead that you don't need to...but seeing that Akron and OU needed to make the plays, I guess you can figure you have to make 'em. It might be a thin line, but it separates victory from defeat, and that's the biggest gulf in sports. Akron won the game mostly by tearing up the Falcon defense. Akron scored 1.25 points per possession against BG, which is the 4th worst game for the Falcons this year and the second worst in MAC play. Just for perspective, BG has not won any games allowing more than 1.08 and has only once once above 1.02. This team simply cannot win without playing good defense, and certainly can't when a team goes for 1.25. (Last note: this is roughly BG's offensive efficiency against Malone. BG had a decent offensive game at 1.08. But, the end analysis, Akron beat BG decisively in every facet of the game. Individually, it was a good night for A'uston Calhoun, who scored 18 points on 8-13 shooting to go with 7 rebounds. Crawford had 13 points on 6 of 10 shooting and 3 assists in only 24 minutes. Dee Brown had 11 points though he short poorly. Thomas shot poorly too, but he did have 7 assists. Cam Black seemed to have another improved game with 5 rebounds in 26 minutes. Jehvon Clarke scored 9 points in 16 minutes, though he needed 11 shots to do it. And that's how it played out. BG fell into 6th place and continues to face a very hard ride home. The game against Kent becomes very important Saturday, as does the Miami game the following Wednesday. Both are critical to BG's seeding. A bye is gone, (or all but, I haven't look at every scenario) but a finish in 5th or 6th nets a home game and at least gets NIU or CMU into the Stroh and probably gets the Falcons back to the Stroh. There's no reason to think that BG is ready to beat the MAC's better teams for three straight nights, but we can't find that out until we get there. Here are the standings this morning, based on the sad results from last night. BG has fallen into 6th, which would leave us playing CMU in the MAC Tourney at the Stroh. BG has essentially a 2-game lead on WMU since the Falcons beat them (and, in fact, every team below them in the standings right now). With a win against Kent and a WMU loss @ UT, BG would clinch the #6 spot. I guess it is safe to say that when last season ended we didn't think we'd be back mired in the middle of the conference, but once again, we are. Anyway, that's for another day. Akron has all but wrapped up the regular season title--if in fact they haven't wrapped it up for sure. BG has two home games coming up. Their chances of getting the bye are essentially gone. We are two back of Kent and if BG beat Kent and ended up in a tie with them, we'd have the tiebreaker. Still, that would take another win and another loss. Note that EMU has as tough a road in the West as you can have right now. Yeah, I see now that the NIU part is wrong, they are obviously done with @EMU. DOH! There's no point in denying it. The Zips are a very good basketball team. Playing many guys, without a true star, they are just cold-blooded assassins. Well coached, good year after year, even with some graduation losses, this is a very strong MAC basketball program that just got done sweeping the Falcons. In Wednesday's game, they came loaded to attack the 2-3 zone, which they did with incredible efficiency in the first half, slicing up the zone not with perimeter jumpers, like most teams do, but with layup after layup. They clearly had a game plan for the interior passing that it takes to beat the zone and they made it work. In the concluding minutes, it was beginning to look like a reversal of the season's first game at the Stroh, when BG controlled much of the game and Akron stole it at the end. However, when BG climbed within one possession, Akron turned back the Falcon rally and preserved a victory that for most of the game was never in doubt. When I look at the MAC standings, we have not lost a game to a team that is currently below us, and we have won only one (OU) from a team that is above us. We're now 6th in the MAC. Certainly still time to write a new story....but at the same time, there's little reason to think it will be any different. We are where we are, and we should be realistic about it. This many years into the program, we continue to be about .500, and not in touch with the best teams in our conference. We might well be solidly in the upper part of the middle, but the Kents, Akrons, OUs and even Buffalos--those teams are in a different part of the league right now. We have a chance to start to turn that around. We have a good Kent team coming to town Saturday. They didn't win in Oxford, but BG did. Home game...this is really key. Without it, BG could fall as far as 7th in the conference. In fact, the team in the MAC that has come closest to beating them (other than the team that actually did) was BG, who lost 56-55 at Stroh. It came right down to the end...Cam Black made a follow up and had a chance at an old school 3-point play to put BG up 2 but missed. Then, Akron took time, set up a play and Nick Harney hit a game-winning shot in which he had a strong collision with Black that many in orange and brown felt was a charge, but no call was made (as if often is not in such a situation) and Akron went away with the win. There is a different challenge for Wednesday, which is to win in Akron, at the JAR. The Zips are 12-1 this year at home and 26-3 going back to last season, with only one MAC loss. They are very solid on their home floor. BG last won in the JAR in 2009, a game that catapulted BG into the MAC regular season title. Akron got their revenge with a semi-final win at the Q on their way to the title. The Zips have the most incredible statistical feat I have ever seen...I was tempted to call it an anomaly but it isn't that...anyway, Akron has 7 players who average between 7 points and 9.7 points per game. This is just an amazing clustering of scoring, and befits a team that has big-time balance and depth. Dambrot has always played a deep bench, and this year is no exception. There are no double figures scorers (in conference play). Nine Zips are averaging 15.7 minutes a game or more and the most any player is getting is 31 minutes a game. Zeke Marshall has really come into his own...at 9.7 PPG he is their leading scorer. He is shooting 51%, gets 5 rebounds a game (remember the reduced minutes for all these players) and 3 blocked shots per game. Alex Abreu is their leader. The SO PG gets their most minutes, and is scoring 8.8 PPG and adding 5 assists. Nikola Cvetinovic and Quincy Diggs can both score, and SO Demetrius Treadwell has been effective on the boards. This is a good team going both ways. They play the most up-tempo game in the MAC, and are 2nd in offensive efficiency (1.08 points per possession). That's a potent combination. They get there by being 2nd in effective field goal%, 1st in FT rate and 2nd in FTs made. They are 5th in offensive rebounding and 4th in turnover percentage. On offense, this is a team without obvious holes. Similarly, on defense, they are 3rd in the MAC at .94 points per possession. That is being built on being 2nd in effective FG% defense and first in free throw rate, as in, not allowing them. They don't force a lot of turnovers (7th) and they don't really need to, and they are fifth in preventing offensive rebounds. This is clearly the biggest challenge any team is facing in MAC play. BG did play them tough at the Stroh, largely through strong defense, and they're going to either need to play lock down D or not miss any shots like they did Saturday to compete in this game. Akron is incredibly solid and well coached and they are a perennial MAC contender. They are one of the programs any team in the MAC should be modelling themselves on...having said that, there's no reason to wait, why not now? The Falcons have a new linebackers coach...Clark Lea, who spent the last 3 years coaching LBs at UCLA. He breaks our string of getting coaches from I-AA Eastern colleges, though he went to Vanderbilt, which at least means he had to do his own homework. Obviously, we welcome him to the Falcons. I do believe Coach Clawson has done a good job with this coaching staff and that his hires have been good coaches who have recruited well and gotten players to improve, though that is still a work in progress. And the BCS pedigree, rightly or wrongly, is likely to make some people feel more at east with him. He replaces some guy we used to have. The MAC didn't do too much bracket busting Saturday and Sunday, and in fact, mostly ended up on the broken end of the scale. Of course, the purpose of the braket buster was to help teams get an at-large tournament bid, and the MAC is a one-bid league, despite what those dudes in Athens (who are getting high on their own stash) will tell you. Anyway, what you want is an away game if you have something to prove. You win at home, and everyone just yawns. Win a big game on the road, and that's some street cred. So, the MAC won four games out of 12. Only Toledo won on the road. (Games below are listed with the RPI of the opponent). OU, BG and Ball State won at home. On the loss side, Akron had a very tough assignment at Oral Roberts, and came up short. Similarly, Buffalo had a tough game at South Dakota and got smoked like a Virginia Ham. WMU lost at North Dakota State, a team with an RPI around BG's. Green Bay beat EMU, they are about in the same place. On the disappointing loss front, Kent lost at home to College of Charleston...they aren't a bad team, but you'd hope Kent would win at the MACC. (Reigning MAC POY Justin Greene did not play with an ankle sprain). NIU loss @ SIU-Edwardsville, and as bad as SIU-E is, NIU is worse. Miami lost at home to TN State, not an easy assignment but you'd like to think you'd get it at home. And, perhaps worst of all, CMU lost AT HOME to Texas A&M Corpus Christi. Best MAC Win: OU over UNC-Asheville. Based on RPI rankings, the MAC is #20 in college D1....same as last year. Two years ago, the conference was #16. Non-Conference Opponents....how did they fare? When we are running through the non-conference schedule, we often find ourselves wondering how good that team is that beat us--or we beat. So, with a little lull in the conference schedule, I thought I'd take a look back and see how those teams fared in the weeks and months since they faced the orange and brown. I'd say there could be 3 Big Dance teams in this group...Temple and MSU for sure and I would guess Valpo would not get an at-large bid. 8-19. RPI 290. 10th in the MEAC. They did beat a decent Delaware team. 12-13. RPI 105. 11th in the SEC. They did beat San Diego State and Notre Dame. 10-19, RPI 193. Tied for 6th in the OVC. They lost their first 9, so they have been stronger since that. They won @Tennessee. 17-12 RPI of 164. Tied for 3rd in the Horizon. Have won 8 out of their last 9. 9-17 RPI of 172. (Remember, they won all 3 games at the Stroh at the start of the year). 11th in the A-10. Lost 6 of their last 7. Two wins over Richmond. 21-5, RPI of 17. Clearly BG's marquee victory of the season. They are leading the A-10. They have beaten Wichita State, Duke, St. Louis---on a 10 game winning streak. Side note: Thank god we got that thing where we play St. Louis out of our system. 9-18, RPI 241. 9th in the Sun Belt. Long year in Bowling Green...so long that their win over BG is their second best victory of the year. 19-10, RPI of 99. Very good team. Leading the Horizon by 1.5 games. Like you don't know. 21-5, RPI of 4. Leading the Big 10 heading into today's game with Purdue. 15-12, RPI of 197. 5th in the Southland conference. They have a really nice win over Oral Roberts. They rode this kind of regular season into the big dance last year. Hot shooting will cure anything. It is like basketball's miracle drug....you cannot beat a team that does not miss shots. As Coach Orr has pointed out (though I have not heard him say it in a long time), you can't let your shooting percentage determine your winning percentage). In other words, you won't shoot like this very often, you need things that can you can do to win every night. So, in this game, Morehead was probably a little better than BG in most facets of the game, yet BG rode very hot outside shooting to take a comfortable win at the Stroh, 73-60. I actually think Morehead is a really well coached team. They had clearly seen the OU game tape, and used many of the same tactics against the Falcons--packing the inside to try and keep Calhoun from getting points, and then running pressure man defense on Jordan Crawford to attempt to force turnovers. Sometimes they even jumped in a double team on Crawford. Anyway, Morehead lost their two best players from last year and they lost their best player at mid year, and they are still a competitive team. I was impressed with their team. So, with the inside packed, BG had to go outside for points. When they did that in Athens, guys got their points but it took a lot of shots. Yesterday, that stuff was just falling into the basket. BG just isn't a 3-point shooting team. In 12 of our 26 games to date, we have made 4 or 5 3s in a game. We had only made 10 in a game once, and that was @Kent. Against Morehead BG made 14 3FG's, in 26 attempts. And that is basketball's miracle cure. It was just short of the school record set in 1989 against Siena, and by far the most 3s made in the Orr Era at Bowling Green. Another note: normally, if BG gets 3FGs, it is on an inside out play, which is the way Coach Orr wants to play. In this case, it was different, BG was rotating the ball around the perimeter to find the player who was open. Scott Thomas had a career night in all this luxurious shooting. Thomas scored 28 points (career high) on 8 of 15 shooting, to go with 4 assists, 4 rebounds and 3 steals. He started the game incredibly hot, making 3 treys in the first 4 minutes of the game, and never really cooled off too much. Dee Brown joined in with 3 bombs in 5 attempts and Jordan Crawford had 3 bombs in 4 attempts. That left BG with an effective field goal% of 71, which is just incredibly high. (Remember, EFG% counts 3FGs as 1.5 baskets in order to give a true productivity per shot). In fact, the last time BG had a higher EFG% was, and this is freaky, the last time we played Morehead in the bracket buster. Which is weird, I think they are a good defensive team, so I am chalking that up to an odd coincidence. So, when you shoot that well, you end up with 1.21 points per possession. Here's where being tempo-free really matters, because we identified in the pre-game that Morehead plays at a world-class slow pace, and in fact there were only 60 possessions in the game. Beyond shooting, BG played a pretty average game. BG had 17 turnovers (in 60 possessions), allowed Morehead to shoot 48% (53% effective), and BG got to the line for only 4 FTs. BG was poor on its own defensive boards but even poorer at getting offensive rebounds for itself. Yet, the miracle salve--all those 3s--cured those ills. A couple of other notes. BG had 21 assists, which is pretty good. Sometimes, I'm not sure about assists. But, I know that when you are rotating the ball around the perimeter and hit a guy who nails a catch and shoot, you get a 3, and I'm not sure it represented the world's greatest pass and it might have been the world's easiest pass. Jordan Crawford had 12 assists. Defenses focused on A'uston Calhoun and it worked for the second straight game. Calhoun had 5 points with 5 rebounds and 5 turnovers. Our other big man, Cam Black, actually had some very productive minutes in the second half. Twice, earlier in the game, he had left the floor, only to be greeted by Coach Orr, armed with emphatic gestures. But he finished with 5 rebounds and 3 blocked shots and I saw a couple of instances where players were driving to the hoop only to be met by the big fella, and then (beep beep beep) they backed up again. So, BG moves to 14-12 on the season. The Bracket Buster provided the Falcons with an opportunity to get some momentum heading into the final conference swing. And, a win toward a .500 season. Wednesday is about as tough as it can get....the top team in the MAC, the Akron Zips, in the JAR. BG will be big underdogs...on the other hand, it was a late season upset at the JAR (miracle shot, Brian Moten) that led BG to the regular season title in Coach Orr's second year...so who knows? Now we take a little break--a little peek into the outside world--and take on someone new(ish) as part of the Sears Bracketbuster game. We have been assigned Morehead State...and let us just stop now and reflect in the fact there is a college named Morehead. It is located in Morehead, KY, and wikipedia says Morehead was named for the first native-born Kentuckian to be Governor of KY, James Turner Morehead. It was not named for Agnes Morehead of Bewitched (and Citizen Kane, according to Wikipedia) though I know a lot of you think that, and it was not named based on a primal wish of the 20 men who founded the town. It was named for James Turner Morehead. (He practiced law in Bowling Green, KY, according to Wikipedia). (not buried in Morehead KY). Morehead is a team who we have busted brackets with before...well, we have played them in the bracket buster, the bracket has been traditionally safe from our Falcons, sadly. Morehead, however, did at least crack the bracket last year when they entered the Big Dance as a #13 seed and beat #4 seed Louisville before losing to Richmond in the second round. It was a huge victory for the OVC and for Morehead--they had previously only won play-in type games. That Morehead State team had a guy named Kenneth Faried on the team. He scored 17 points a game last year and led the nation with 14 rebounds per game. This year, he plays for the Denver Nuggets. Their second leading scorer was Demonte Harper at 15 points per game and 3.5 assists. I don't know where he is playing this year, but it isn't Morehead State. Both guys were seniors. So, this isn't that Morehead team. These dudes are 15-13 with 3 non-D1 victories. Just like BG, they have beaten Austin Peay (they have done it twice) and Ball State. Like BG, they lost to Kent in Kent. Their quality wins are over a good Princeton team on a neutral floor, and @Norfolk State. They have some marquee losses but they also lost at home to South Dakota and Jacksonville State and at SIU-Edwardsville. They are 8-6 in the OVC and are in 5th place. They have won 6 of their last 8 so perhaps they are rounding into shape. The first thing this game will be about is pace. All stats below are based on Morehead's OVC games, since it gives us a much cleaner view of the kind of team they are, eliminates those non D-1 teams and the marquess loses. Morehead is averaging 58 possessions per game in their conference season, which the absolute slowest in D-1 basketball. (for perspective, EMU is doing 59.5 and BG, hardly an uptempo team, is doing 63.7. And BG struggled in a down tempo game with EMU...there may be a couple of differences though. Sometimes you see a team that is very deliberate on offense, but scores efficiently on those possessions. This is not that team. They are 9th (out of 11) in the OVC in offensive efficiency. (The actual number is 99.6, which would be 7th in the MAC). They are 8th in EFG%, 11th in turnover percentage (24.5%) and 8th in FT Rate. They are 4th in offensive rebounding, which means the Falcons will need to have shored up that part of their game following the rebounding collapse in Athens on Wednesday. They try a lot of 3s, though they are 9th in their conference in actually making them...but teams have been mysteriously getting hot against BG from beyond the arc and I would expect the Eagles to test BG on the 2-3 zone. Interestingly, they are 4th in the OVC in defensive efficiency at 101.5, which is OK but would only put you 7th in the MAC. With that dichotomy in mind, they are 4th in Effective Field goal defense, 2nd in forcing turnovers, 4th in offensive rebounding percentage but 9th in allowing free throws. In other words, they appear to be a good defense in the OVC, which is a most offensively minded conference than the MAC. Their top player and scorer in non-conference play was G Terrance Hill, but he suffered a season-ending injury and has not played in weeks. The slack has been picked up by Drew Kelly a 6'7" (and refugee/transfer from the Oxford-based lair of the evil genius) who is scoring 12.7 points and getting 5.7 rebounds, both team highs in OVC play. Senior G LaMont Austin is getting 3.8 assists per game. This local media story makes the point that the Morehead Coach, Donnie Tyndal, might be doing a better job coaching this team then he did last year. You lose your top 2 scorers to graduation and then your best player this year to injury and you are still competitive. Morehead does have 6 road wins this year. A couple of things. Obviously, beyond just being competitive, this game doesn't mean much. However, a winning season would be nice and this is one you need for that to happen, and you'd like to see the guys get their mojo back heading to Akron on Wednesday. I think this is a game BG should win at home. Let's hope that's what we see. Tells the story. BG must pass OU, a tie would go to the Bobcats. As imperfect as it might have been, heading into the last 6 minutes of the game, BG was right where you would want to be. In fact, it reminded me a little of the Toledo game, in that BG trailed pretty signficantly and then got back into the game....happened a little later in Athens, but it reminded me of that. Until it didn't. With about 6 minutes left BG had a 3 point lead and the ball and a run out opportunity to get a transition basket, and BG made a turnover. OU game down and Cooper nailed a 3 to tie the game. The trey was the opening to a 9-0 run over 2 minutes that itself fed into a 20-4 run that lasted until the end of the game. BG ended up losing by 13, in a game where they were ahead with 6 minutes left. I didn't see the game, but it sounds (and the stats seem to show) that OU came out like a team that had lost 2 in a row and couldn't afford to lose one of their two remaining home MAC games. They outhustled and outworked Bowling Green, seemed well prepared and even when BG got back into the game, they turned back that challenge with an exclamation point. This was more or less what Coach said in his post-game. He was asked if it was a matter of needing more depth, and he said that when you are getting beaten to "fifty-fifty" balls in the first 10 minutes, that isn't about depth. The victory started on defense, and then continued to the offensive boards. Based on Todd Walker's description, they were running a pressure man to man defense, and they were sometimes double teaming Crawford on the ball. They did a great job of denying the ball to A'uston Calhoun, who had only 4 points after starting to look like he was going to emerge as the kind of player he often looks like he can be. Calhoun's "gotta understand he's gonna have a target on him. It's not going to come easy, that's all I'm going to say." Coach also said that when Calhoun has to find other ways to contribute when he is being double-teamed, and noted that he had 0 defensive rebounds in the game. BG's guards did what they could to take up the slack, but in the end, BG got only .89 points per possession. At .92 points per possession or lower, BG is winless this season. Because of the pressure in the paint, BG shot 18 3s, which I am sure is more than we like to see, and we made only 4, which seems to be the normal number so matter how many we attempt. BG had its second worst game of the season on the offensive boards (21%). Turnovers were a touch below BG's season average at 19% and BG did not get to the line very often. BG was 13 of 14 from the line, a nice improvement from the UT debacle. On defense, OU didn't outshoot BG by that much. They were 4 of 17 from 3, and their EFG was 5% than BG's. The difference was that BG allowed OU to rebound 47% of their missed shots, second worst in the season. Those high percentage second chance shot are what pushed their shooting up over the Falcons. OU also shot 28 FTs and kept BG in the game by only making 18, which is still +5 for the game. And those rebounds, on both ends of the floor, they just indicate a Bobcat team that was willing to do what they had to do to win the game, and outhustled and outworked the Falcons. Individually, BG was led by Scott Thomas, who had 17 points and 5 rebounds. Dee Brown continues to play well, scoring 15, and Jordan Crawford had 11 with 3 assists and 4 turnovers. None of those 3 guys shot the ball well, so a number of possessions were used up getting those totals. Craig Sealey had 9 points in 13 minutes off the bench. Oglesby had 6 rebounds. So, BG drops behind OU into 5th. That's a season split. OU would actually own the tie breaker against BG if they tie. Bear with me...after head to head, the next tie-breaker is division record, and OU lost twice against the West and BG once, which means that in order to end up in a tie, OU would have to lose one fewer times than BG against the East and therefore have a better record against the East. Which means OU is actually two games ahead of BG with 4 to play for the final bye. Conference play takes a bracket buster break now. When BG returns, it will be at the JAR against the Zips....without question the top team in the MAC in the regular season. This is the tough part of the schedule. The first is that the Bobcats have really struggled against a 2-3 zone. Our game preview noted how poorly they shot against BG in the first game, and the article notes that they really struggled against EMU's 2-3 zone, too. Ohio set season lows with 15 made field goals and a 31.3 percent shooting percentage against Eastern Michigan’s 2-3 zone on Saturday. The article also notes that OU has not had the 3-point shooting to attack the zone this season, and Groce is talking about taking the battle into the paint, which should be very interesting. On the other hand, UT had not had the 3-point shooting to attack the zone until they played BG and it showed up all of a sudden, so we'll put that in the list under "wait and see." I am going to work off the assumption that having your pants on fire is a good thing...I'm no basketball coach or anything. I hope mine don't catch on fire...anyway, conference play is great for this in one-bid leagues, and I look forward to what should be an interesting game tonight. Here they are for today...if things break right, BG caught a break with EMU losing @CMU last night. The Falcons have some tough games coming up, and it will only really matter if they end up with some wins, but in the meantime, EMU is now 2 back in the loss column. Also, BG is 13-11 overall. They need an even split of their last six games to finish over .500 for the season. While that is a modest goal, it would only be BG's 3rd winning season since West Virginia, which was 10 years ago. Athens OH is the next stop for the Falcons, in a game that is shaping up to be pretty important as the teams in the MAC East battle for byes in the upcoming MAC tournament. A lot can change in a few games...it wasn't but a couple of weeks ago that the Bobcat Faithful where whining about the MAC's inability to earn them a televised bracket buster game, what with their hot start and all...even when they were up near the top of the standings, they had already played more of their home schedule than anyone else, and it was likely to be hard to sustain, and, indeed, they went out and lost @EMU and @UT and dropped themselves into a tie with BG for 4th. Having said that, despite being on a two-game losing streak, they have won all their MAC games at home and are 13-1 at the Convo so far this year. They have to be feeling the pressure, and BG did beat the Bobcats at the Stroh to open MAC play. The Falcons are playing well...but against the West...I just think this has the potential to be a really interesting game. It would appear to me that OU's struggles in the last two games have been on the defensive end. Against UT, they gave up 1.11 points per possession, their worst of the season and against EMU, who can't score against anyone, they gave up 1.08 points per possession, their third worst game of the season. Which is unusual....during conference play, they have been the 2nd most efficient defensive team in the MAC. Their defensive style is to force turnovers. They have forced turnovers on 26.7% of their possessions in conference play, which is 3rd in the nation. When they don't get a turnover, they are 4th in the MAC in defending the shot. They are in the middle of the pack in preventing offensive rebounds and they do allow a log of free throws, but, in general, they have been successful with this style of defense. I am sure they will be out to show that the last two games were an exception to the rule. On offense, they are 6th in offensive efficiency. This is built on taking good care of the ball (3rd in the MAC) and they get to the line--2nd in the MAC in free throw rate (and first in free throws made). This all mitigates that they are 10th in shooting the ball. If you look again at the chart above, you can see that BG broke that code...OU shot poorly and yet BG forced turnovers, and OU had what was then and is now their worst offensive game of the season. Individually, they are led in scoring by DJ Cooper, who is scoring 13 points, and getting 4 rebounds and 4 assists per game. Now, that's not quite the whole story. Dude is shooting 28% from the field. His first two years, his offensive rating was 110 and 107, but this year it is 90, which is 69th in the MAC, a 12-team conference. It is his lowest shooting percentage of his career by 10%. And, his assist turnover rating is 1.3 after being over 2 for the first two years and he's 17th in the MAC. This is a good example, I think, of some gaudy numbers for a guy who is using up a ton of possessions to get where he is going. Walter Offut is scoring 12.5 points per game. The OSU transfer has a better offensive rating, though he is only 25th in the MAC. He does get to the line, he's 3rd in the MAC in that category. Behind him, Ivo Baltic is scoring 9 points a game. He missed most of the EMU game with an injury, but a tweet from Athens just now says that he has been cleared to play tomorrow. It will be interesting to see how many minutes he gets. Jon Smith and Reggie Keely are their top rebounders with about 5 per game. So, no real offensive stars, but above average in the MAC and we knew that. The test is on defense. In the first game, Cooper had 15 points, 3 assists and 4 turnovers, shooting 5 of 17, and Baltic had 14 points and 5 assists. Keely added 7 rebounds. For BG, Crawford had 16, Thomas 10/10, and Calhoun 12/1. Dee Brown added 13. OU is clearly a tougher team at home, but I think/hope BG is better than when the two teams played in January. To me, the keys are how well the guards take care of the ball, and if BG can get Calhoun going in the paint. If he is a force inside, lots of things open up for us. The second half of the UT game would be a pretty good model. One last thing...at his presser this week, Coach Orr noted that BG had played much better in a pressure defense than we did in a half court defense. We just seemed to have more energy. He did hint that we'd continue to play that way in the future. We played a zone mostly in the first game, and I'd certainly expect to see that for most or all of the game tomorrow. The collective thoughts of the MAC Bloggers....check it out on Hustle Belt. The Football Rules Committee met last week and released some proposed changes to the rules. This is supposed to be a year when rules aren't changed (apparently that is only done once in a while) but there is an open exception for safety rules, which these are. The most striking would be to follow (mostly) the NFL's lead on kickoffs. Under the proposed change, kickoffs would move up to the 35 and no more than a 5 yard run up would be allowed for the kicking team. Now, what you saw in the NFL was a lot of kicks brought out of the end zone, even deep in the end zone. To discourage that, the committee's recommendation is to have touchbacks on kickoffs come out to the 25. This would obviously have a huge impact on the game. It would greatly de-emphasize the kickoff return and the kickoff returner. Look, if the data really shows that this play is most likely to cause injuries, I'm for whatever has to be done. It is an exciting play, so it is a shame on one level, but if football doesn't improve its safety record, I honestly think this article could have it right . In other news...if a player's helmet comes off (and it seems to happen a lot more often now), that player must leave the game for a play, just like if he was injured. And, he can't participate in the play. Sometimes you see a guy lose his "hat" and still go running in to make the tackle. No more. There are also some tweaks to the blocking below the waist rule, a rule about crashing into that blocking "shield" on punt plays, and others. But the kickoff and the helmet penalties will have the biggest impact on the game. From here, the Playing Rules Oversight Panel is expected to vote on the proposals next week via conference call. I'm guessing it is pretty well set to go. And deservedly so...the guy had two monster games and easily eclipsed anyone else. I voted for him in the MAC awards as well...the MAC gave the West to Rian Pearson...I didn't even think he was the best player on his team for the week, but anyway. I don't understand why this question always gets asked. I know they are trying to find out the emotions involved...but it is ALWAYS frustrating to lose. It is just a pointless question. The only exception is in Muncie, where the reporters want to know why you were shading the high ball screen to the weakside. "Don't feel sorry for the Rockets." To which I say: "Don't worry. Nobody does." The East has been the dominant division in the MAC for a few years, and that was literally never more true than it was this year in cross-over games. On one hand, the MAC has de-emphasized divisional play by making the tournament seedings "division agnostic," but on the other hand, there is a huge advantage in scheduling. Ball State and WMU both, for example, will benefit from a second run through the (by far) weaker teams in the conference and BG, currently in the hunt for a bye, has to play Akron, Kent, OU and Buffalo. It is what it is. But, in a weird way, as long as the league is scheduled like this, the tournament seedings cannot be truly "division agnostic." This year, there were 36 games....and 30 of them were won by the East. This is the highest over the past four years. The last three years were 27-9, 26-10 and 29-7. Crazy....over four years, 112-32. FWIW, there are other ways to schedule. The Big East has more teams than the MAC and they don't use divisions. Anyway, it is what it is...which means, we use this system, and the East continues to be much stronger than the West and it isn't close. (I think you can argue only the Rockets are on an upward vector in the West, too, but that's for another day). So here they are, the REAL MAC standings for today. As you can see, BG has now moved up into bye territory as OU continues to struggle. Having said that, our ranking ahead of them is based on the win at the Stroh, but we play OU again Wednesday. There are 5 games left for everyone. If BG were to beat OU in Athens, we'd be 1 up plus the tie breaker. As of now, BG is 1 game up on EMU (with tie breaker not in our favor) and 3 up on Ball State and WMU (both with the tiebreaker in our favor). Those two are unlikely to catch us. You'd like to think 6th is our bottom. OU is obviously a threat...and EMU will get to play CMU and NIU again, which can only help their chances. In front of their biggest crowd in seven seasons, and one that mostly consisted of their own fans, BG and UT played a very entertaining, competitive game that was made all the better by the fact that the Falcons Won and the Rockets Lost. (66-63). It was certainly an odd game--UT had been dreadful from beyond the arc but they got read hot--and BG had a historically bad night shooting FTs--but in the end, BG had a late run when they needed it and picked up the win. To begin with, I thought the game environment was great. The students were fantastic, and the big crowd really added energy and enjoyment to the game. It was fun. One of my concerns has been that whenever BG has seemed to get a decent crowd over the last few years we have lost, so let's hope that we can sustain this one and get some of those people back for our three remaining home games. We'll have another sell out next year when MSU comes in....anyway, it was a great night to be a Falcon. For much of the game, victory was far from assured for BG. In the post-game, Coach likened the early minutes of a game like this to a sugar high--you come out with an energy burst but it fades quickly and you gotta keep going. Eight minutes in BG was up 12-5, but then the game turned and the Rockets really took control of the game for about 18 minutes. They were simply unconscious from 3, and they had been the worst in the MAC (in conference play) coming in. At the same time, BG was having trouble getting anything to fall, and the Rockets closed the last 12 minutes of the first half on a 24-10 run. They came out of the locker room with an old school 3 to go up by 10, and they had done what every road team wants to do...taken a big crowd out of the game. They led by 10 most of the time until there were 14 minutes left in the half. There was a lot of talk in the post-game presser about defenses. 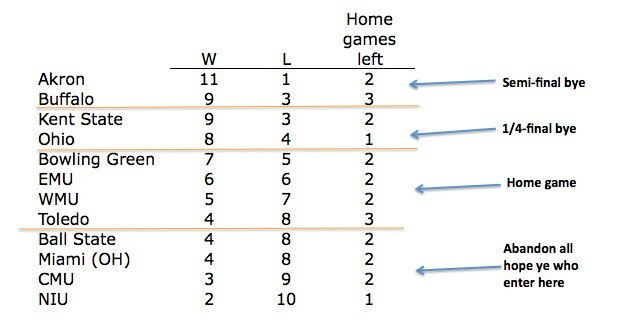 BG was in their 2-3 zone (despite brave talk earlier in the year and a lot of time spent in the non-conference schedule in man, we are now playing mostly zone) and I wondered (along with many others) whether BG should come out of the zone and go to man, given the Rocket's hot 3-point shooting. Coach said that he felt that BG was simply missing assignments and that he still felt the zone was the best...partly because BG was concerned about defending Rian Pearson in a man set. As a personal aside, one of the things in basketball is that a lead built on unconscious shooting (and bad shooting on the other side) is a little bit like the mortgage crisis, and is generally unsustainable. It was a reasonable bet that the Rockets could not keep that up. What the Falcons did do defensively was go to full and 3/4 court pressure. They had used it early, and then pulled it back, and then went back to it. Also, BG has a nuisance pressure and a real pressure, and they switched to the real pressure, and I thought it made a difference. BG forced some turnovers, and even when they didn't, UT's clock was often at 22 before they got into their set. They only beat it once that I recall for an easy basket. Scott Thomas is incredibly effective in that set. When you are looking at a cross court pass and he is lurking in the middle, it is very intimidating, because if you don't make the perfect pass, he will get it. The game turned around so fast it was hard to believe. In about 90 seconds BG went on a 10-3 run, including 3s by Scott Thomas and Dee Brown, and BG was down 3 with 13 left. UT brooked that storm and continued to lead by a 5-6 margin until there were about 7 minutes left when Brown his another 3 to cut the lead to 2, and then Calhoun followed with a dunk to tie the game with 6:54 left. Now, everyone in the arena is engaged, the place is electric...the teams responded by remaining tied at 52 from 6:54 to 4:03. The game was also tied at 57 with 2:40 left. Late in basketball games, sometimes a couple of plays set the tone and you can ride it out, and that's what happened. First, BG ran a play for Scott Thomas to drive to the hoop. You don't see that very often in our set, but he was on the dribble, hit the elbow and drove the lane. According to Coach Orr, he kind of looked at Oglesby which froze the man on him and Calhoun's man had to stay on him and Thomas got to the rim for the old school 3...which he converted on a night where BG could not hit FTs. Then, on the press, Crawford got a steal and came down under pressure and hit the layup and BG had a five point lead. BG got a missed shot but UT came out of the scramble with the rebound and fed Curtis Dennis who drained yet another 3 and with 1:14 left it was a 2 point lead. At this point, BG just needs one stop to get the win, and they got it as a 3 fell off for UT and Oglesby got the board and got the ball to Brown, who was fouled. Brown hit one of the 2 FTs and BG was now up 5 with :16 left. Brown missed the second shot, but as Julius Brown was bringing the ball up for UT, Crawford picked his pocket and forced them to foul him again. He split the free throws, and then UT came down and nailed a 3 to get it back to 3. They fouled Scott Thomas, who missed both free throws, but with 2 seconds left, getting down floor off a rebound and without timeouts is almost impossible and the Falcons had the win. If you like basketball, this was the kind of thing you like. BG was led by outstanding games by both Scott Thomas and A'uston Calhoun. Both made clutch plays and had just great games. Thomas played 40 minutes, had 21 points on 9 of 14 shooting, with 6 rebounds--5 on offense--and 4 steals. Kids, that's a stat line. Calhoun had 20 points on 10 of 18 shooting, with 12 rebounds and 7 on the offensive glass. Also a commanding night. Dee Brown contributed 11 and 4 assists and while he didn't shoot well, he did have two clutch second half 3s. Jordan Crawford struggled, especially in the first half, but ended up with 8 points and 4 steals...but 2 assists on 3 TOs. BG played a very tight rotation. Only Oglesby got more than 10 minutes off the bench and had 8 key rebounds. In terms of team stats, it was a very weird game. I've already mentioned UT's ridiculously hot shooting. You'd think if you had one team make 12 of 19 from 3 and their opponents go 6 of 20 from the FT line you 'd know which team won. BG was fortunate to be able to force 18 turnovers and make only 11...and to get 50% of the available offensive rebounds, which created a huge number of second chance points and gave BG enough offensive firepower to win the game. A couple of notes. It was BG's worst FT effort since the Xavier game in the 09-10 season. And it was the second best offensive rebounding night of the season for BG, second only to the Kent game. And so, the Falcons win their 4th straight and their 4th straight over the Rockets. It was a very satisfying victory. The Rockets are on their way back...last year's team was non D-I quality, but there are now some players here and I suspect that the Rockets will be competitive next year...and in the West Division of the MAC, there are easy wins to be had. UT is the second youngest team in the MAC and the only team without a senior. The Falcons say good-bye to the MAC West and move back into the MAC East. Wednesday's game is at a reeling OU team that BG beat at the Stroh. It will be very interesting to see how that plays itself out...we are tied with OU in the standings and a win would put BG one up on them with the tie breaker. To me, the key is Calhoun. He has now posted two strong games in a row. We always knew he had this in him...if he continues to be a dominant presence inside, this team gets a lot harder to beat. More to come later today, but the Falcons did get the win Saturday in the Stroh in front of our biggest crowd at the Stroh and in the Orr era. (The last time we drew more was 7 years ago when we played Toledo on the day after a huge snowstorm and BG was down big at halftime--even bigger than today--and rallied for the win. Actually one of my big Anderson Arena memories). Anyway, in addition to the big rivalry win, the best part was those masked Rumpus Dudes from UT heading over to our student section to dish out a little smack talk based on a half time lead. They stood there like doofuses pointing at the scoreboard....only a Rocket fan talks smack when they are up at halftime. Presumably they didn't do anything similar on the walk of shame to their car. Great night to be a Falcon...more coming later. It might well be turning into the most anticipated game in the Orr era at Bowling Green. Word on twitter from BGSU is that the game is nearing a sell-out, and while that will include some Rocket fans, it will also be the first real big-game atmosphere in the Stroh Center and in the Orr Era. Our crowds have been tweaking up...we started at 1,500 and now we are up to 2,000....and it would be great to re-introduce our program to all those new fans by delivering a victory over our hated arch-rivals. Over the past few years, UT is clearly at a low point for their program. Having said that, I think they have some players now and are starting to point their way out of the swamp. They are the only West team with two wins over the East, winning @Miami and at home against OU, both of which the Falcons also did. Overall, they are 3-7 in MAC play and that win over Miami is their only win on the road in the conference this year. Yes, on paper, the Falcons should win this game. BG has played well at home--though we are clearly not bullet-proof--and we are playing well and it will be a big crowd and things will be crazy and I think we're probably better right now than UT is...even so, you know, its the Rockets, and until you have driven a wooden stake into their heart, you don't let up. UT will be jacked up for this game, too, and they are coming off their biggest win in conference in quite some time...and it is a rivalry game for them, too. Nothing will soothe my nerves until the clock has nothing but zeros on it and BG has the most points. 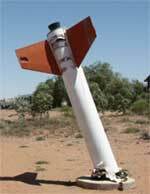 Until then, the Rockets are an imminent threat. The fight against evil never sleeps. Code Orange. The Rockets are lead by Rian Pearson, who is emerging very quickly as one of the MAC's top players. He came with Kowalczyk from Green Bay. In conference, he is averaging 19 points, first in the MAC. Now, he is on a struggling team and is using 30% of their overall possessions (3rd in MAC, also taking 33% of all shots) to get those 19 points, so you have to balance how you view that. His offensive rating is 34th, for example. He's also 3rd in rebounding with 8 per game, and he's only 6'4". Conclusion: he's a good player, maybe not as good as he appears at first blush. Curtis Dennis (New Mexico) is also scoring 11 points a game, but those are their only double figures scorers. Julius Brown and Dominique Buckley both scored a lot against UT's very soft non-conference schedule, but have been struggling more in MAC play. In other stats, Fr. PG Julius Brown has 4.9 assists per game over 4.2 turnovers. Reese Holliday is 2nd on the team in rebounds. Holliday is also their best 3 shooter, but he doesn't do it often...the guys who do it most often have not been effective. Their turnover has been incredible. Of the 8 players averaging more than 10 minutes per game, 5 were not on the team last year, and they are also the top 5 in minutes. This team is a lot like Bowling Green on offense. They do not shoot 3s. In fact, they are last in making the 3 and 10th in trying them. Accordingly, they lead the MAC in FG%, which is what you would expect when you shoot close to the basket. Overall, they are 9th in offensive efficiency (.96 per possession) and 8th in EFG%. They are 10th in getting to the line, 6th in turnover % and 6th in offensive rebounding. To me, that adds up funny....you'd think a team with those numbers would be higher. I guess it shows how hard it is to rack up points without some 3s in the mix. On defense, they are 8th allow 1.03 ppp. They are 10th in EFG% and 8th in allowing FTs. They are good at forcing turnovers, second in the MAC, which probably accounts for how they get to 8th overall. They are 10th in allowing offensive rebounding. The fear...the fear is that the cross-over schedule indicates a team that plainly has talent is beginning to gel, and this is the wrong time to be playing them. Now, whether that's what actually is happening or not, we will not know under later. All I know is this...this UT team is going to get better than they are now, which is not very good. At all. Let's hope the Falcons (who could be gellin' too) keep them there one more game...play the way we should at home, and win a game we should. 1. Right now it looks like Akron/Kent State/Buffalo/Ohio are the top four teams. Beyond them who looks the strongest (not necessarily who will have the best record) and seems like a MAC Tournament sleeper? To me, the team with the best record is also the team that looks the strongest. Akron appears to be the conference's best team. The are winning and still have 4 home games left in the final 6. They are incredibly balanced...I doubt if any other team in D1 has 7 players averaging between 7 and 10 points a game. They are strong on both sides of the ball and Marshall is really coming into his own. As for a sleeper, in a way it is Kent, but beyond that, I'd like to say my Falcons, but I need to see how they fare against the East first. Teams like EMU can be tough to be in tournaments because they can always play tough D...on the other hand, BG is the only team in the East to fail to get 60 on them. 2. This is the first year MAC Tournament seeding is division agnostic. If it began today the East would have the first five (!) seeds. Can a team from the MAC West get a top-two seed and bye into the semifinals? If not, what's a realistic seed for the West winner? No, probably not a top-2 bye but they have a shot at a top 4 bye. The standings are distorted right now because those West teams have a huge advantage coming home in that they get to play each other. EMU is 3 back of a top 2 bye and WMU is 4 back...don't see those flipping, but if EMU (or WMU) makes ground up, they could sneak in. My expectation is that the West could end up with the #5 and #6 seeds just based on a much easier schedule. 3. Ernie Zeigler's team up in Central Michigan doesn't seem to be improving. Is he the most likely MAC coach to be fired after the season? I would think so. He has a pretty thin track record...yes, there are a couple of West Division titles in there, but that isn't worth very much. They have never been in the Top 5 of the conference, and now are in the bottom 5. They are young...but they also have the best recruit to come to the MAC in many years and they still can't produce. The issue is, if Zeigler goes, what does Trey do? Hard to see him staying in Mt. Pleasant. I can't imagine any other MAC Coach getting the boot. 4. WMU coach Steve Hawkins gave two of his starters, Matt Stainbrook and Mike Douglas, one-game suspensions for key road games, Ohio and Kent State, respectively. They lost both games but barely. Let's play "Scruples." If you're coaching your favorite team and one of your key players broke team rules, would you have them sit out a big game? I think you have to. It isn't an easy thing to do, but I think when the players get the feeling that there isn't any control on them, they can make poorer decisions and it shows up in games. Case in point, in my mind, is Tom Amstutz (which is another sport, I know). Also, if you are going to suspend key guys, do it for a road game. Is the scrupulous? 5. Jason Arkley of the Athens Messenger brought up a neat discussion on Twitter the other day. He talked about Ohio Bobcats players in recent memory who were not very liked by his own fans, D.J. Cooper being one of them. Who from your team did you consider unpopular during his playing days? "Kind of surreal" Coach Louis Orr.